FWIW, thought i would report on windsurfing and kiting winds at lake arenal, costa rica this winter. i was there for almost all of january and i sailed every day but one. most sail sizes were 4.2 - 4.7. a couple 5.3 and a couple 4.0 days. i would dare to say it was the best year i've seen in the 20 years i've been going. the interesting thing was the weather. it was sunny and warm every single day. typically it rains a fair bit there (though mainly down the lake), but this year was like being in hawaii. unbelievable. anyway, just wanted to mention to bay area sailors that it was exceptional. i hope to see more of you there next year. feel free to PM me if anyone wants more info on it. That's outstanding you caught such good wind - score! I've been there x 3 (Dec, Feb, and March) over the years, all short trips mixed with visits to other parts of the country, but got only 1 marginal sailable day. Pretty cool sailing next to the volcano. I totally recommend it, but good to have a back-up plan. What would you say are the safest months for wind? Anything for non-windsurfing wife and kids to do around Tilaran? They're partial to the CR beaches and rainforests, which are a ways from the lake. typically jan-mar are windy almost every single day. but i guess if you went for a 2 day trip you could miss it. not much to do at the western edge of the lake but, as you said, there's a lot of activities at the eastern edge in the wet jungle. Posted: Wed Mar 20, 2019 3:27 pm Post subject: Volcano and associated hot springs if you can get to it. Volcano and associated hot springs if you can get to it. with big rocks. From Tico winds to the Volcano. Is the road still like that ? i remember the days you're talking about ctuna. that was an adventure. you wouldn't believe it now. the road rings the whole lake and hasn't a single pothole. of course, one rainy season and they'll no doubt come back. As always, there's no guarantee with our sport due to dependency of mother nature, but as "tstizzle" pointed out, Jan thru Mar might be the safest bet. I don't travel like the pros do, but I have been fortunate enough to visit several international windsurf destinations, and Costa Rica Ticowind (http://www.ticowind.com/) is hands down one of the best spots that I have sailed in terms of wind consistency, relaxation factor and non-windsurfer spouse and family friendliness. Unlike most windsurf launch site, the rest area is sheltered from the wind by the rainforest behind. You can take my wife's word on this one because she has developed "surfers's eyes" (not joking ) from visiting too many windy spots with me because of my sport. 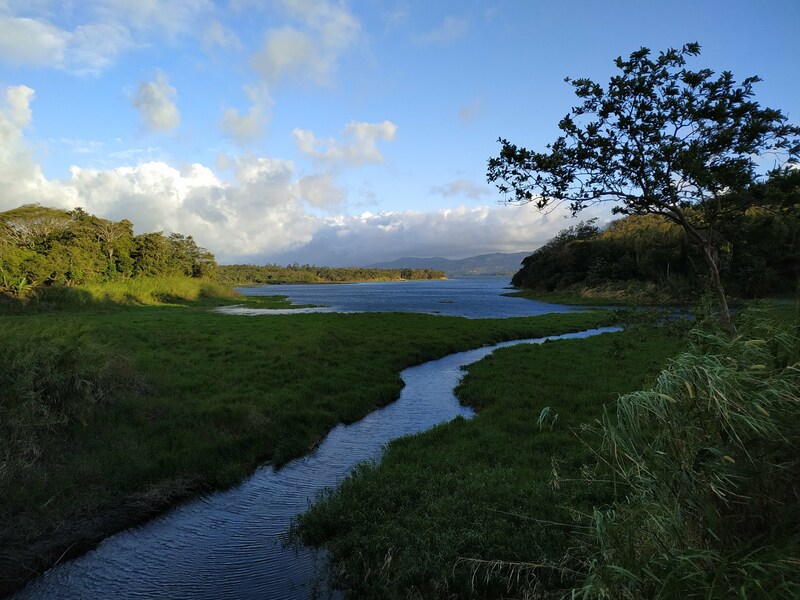 Also, Lake Arenal is the area that is surrounded by denser rainforests and not so much by the coast especially in the Nicoya Peninsula. So if your family loves nature and the rainforests, you definitely have a higher chance of seeing wildlife (howler and capuchin monkeys, sloths, tucans, parrots, etc) without having to visit animal rescue reserves. There are several nature sites you can visit with your family like the hanging bridges, river floats, Arenal Volcano National park, and a couple of neat hikes to waterfalls, etc. Sailing wise, they have a community of friendly and relaxed windsurfers. There are some really good windsurfers who are always willing to share any tips and tricks that might help improve your sailing skills. The conditions are great for both bump+jump and freestyle. You might also be surprised to find ocean-like swells on the right side of the main sailing area on 4.0m day (which is common). If you decide to rent, they do have one of the most updated equipments I have seen compared to other spots. For e.g. I tried out the Fanatic 2017 Stubby TE when I visited in 2017. Road condition wise, since the new highway was between between Liberia (LIR) airport and Canas, travel time has been cut down by at least a good 20 mins. As "tstizzle" mentioned, the potholes between Tilaran and the Lake are almost non-existent these days. Overall, I highly recommend it for windsurfer looking for a Windsurf+Family vacation spot.